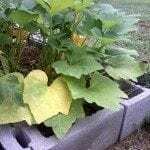 Summer squash lower leaves turning yellow and stems breaking near leaf. Could this be over watered? Cucurbits? This could be either over watered or under watered. Both will cause this. It could also be a lack of nutrients. They should be getting at least 2-4 inches of water a week but there should not be standing water around the plants. If you have not fertilized and did not amend the soil at the beginning of the season, some additional nutrients may be helpful.